Basecamp Studio, 2531 NE Studio Rd. 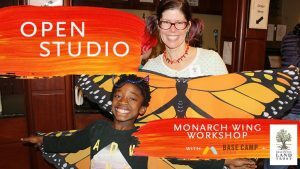 Use fabric, paint, and other materials to make your own monarch wings then join Deschutes Land Trust, Base Camp Studio, and The Environmental Center to walk in a kaleidoscope of butterflies at the Earth Day Fair & Parade. This drop-in wing making session will led by Base Camp Studio and Land Trust staff to help us on our journey to create and protect our butterflies.